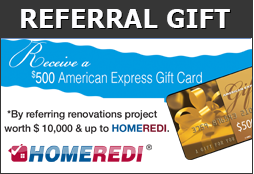 HOMEREDI Painting expertise has been brought to you by our team of Painting Experts with more than 50 years of combined hands on experience in all aspects of interior and exterior painting projects completed for our discerning clients in the North Shore of Long Island. We help you select Paint colors for every room and for every style genre to ultimately give your home a new and exciting stylish facelift. All Real Estate professionals agree that a well commissioned and staged home will sell quicker and for a higher price than homes that neglect the importance of a pristine paint job. Painting projects could be a costly undertaking and very time consuming but with our HOMEREDI Revolutionary Fixed Price Painting Packages we will get your project started As Easy As 1-2-3. Contact us at 1-855-SAYREDI to schedule a visit from one of our trained estimators. All pricing packages include selected paint of your choice from Benjamin Moore or Sherwin-Williams portfolio, 2 coats of paint applied to Walls & Ceiling, Base molding, Doors and Window casement trims (not including doors or windows). Ala Carte Painting Services are priced separately or in addition to any of the packages offered.